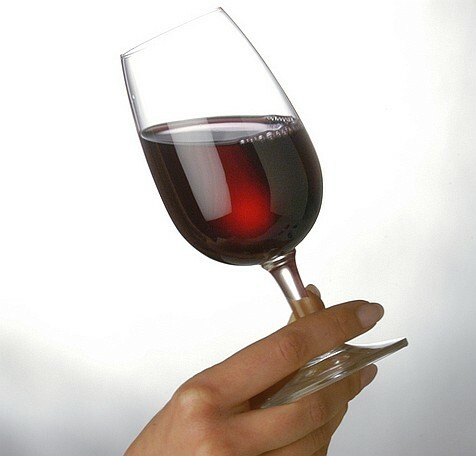 Red wine in a glass – What should it look like? Much is talked about the nose or bouquet of a wine and, of course, its taste. However, the appearance of the wine is just as important in the process of wine tasting, particularly as it begins the whole procedure. Red Wine UK recently published an interesting article on this topic. The way a red wine looks in the glass prejudices our other senses and our brain begins to assess whether the wine will be enjoyable or a disappointment in the same way our first glance at the presentation of a meal in a restaurant may make us salivate in anticipation or wrinkle our nose in disgust. So how do you go about examining the appearance of a red wine? Firstly, make sure you have a proper red wine glass. You need a large glass with a bulbous bowl and a long stem. The glass should be clear and thin so the appearance of the wine is not tainted by colour or distortion. Fill the glass only about a quarter full so you can tip the glass horizontally with the wine settling in the curve of the bowl rather than spilling over the edge. Secondly, make sure you have the correct light. Traditionalists and romantics will argue that red wine should be examined in candlelight. However, in these days of electricity a good spotlight against a white background tends to work better. The key features to look at are the clarity of the wine, the density of the colour, the colour of the wine’s rim and its viscosity. These features will give you an early indication of the wine’s quality, age, grape, geographical origins and alcohol content. Experts will be able to interpret more than a beginner or amateur taster but do not be intimidated – examining the appearance of a red wine is all part of the fun and enjoyment of wine tasting and even a beginner will be able to detect something. The best way of looking at a red wine’s appearance is to tilt the wine glass away from you so it is almost horizontal and look at the wine against a white background. This allows you to get a good view of both the middle of the wine and the edges. The first feature to look at is the clarity of the red wine. The wine should be clear and transparent rather than cloudy or slightly fizzy which indicates a bad wine. Once the red wine has passed the clarity test, look at the density of the colour, which should be bright rather than flat. Younger wines tend to be more vivid in colour whilst red wines which have been aged tend to be a bit paler and have a slight brick brown hue, although if a wine is too brown it may have been aged for too long. More intense, darker reds suggest thick-skinned grape varieties such as syrah/shiraz. The darker colour can also mean the wine is from a hotter climate. Better quality wines tend to have a glossier colour and a more subtle change in shade towards the rim. Next, take a look at the rim of the red wine, or the meniscus. If the intensity of colour continues to the rim it indicates a good quality wine. The meniscus of younger wines can be slightly watery or have a slight purplish-blue hue. If the rim is too watery then it is probably not a quality wine. The indication of a wine’s aging is visible first of all at the rim so older wines may have a slight brown colour at the edge. Finally, give the red wine a good swirl so the liquid clings to the sides of the glass. Then watch how it trickles back down into the main body of the wine. These trickles are known as “legs” and help to show the alcohol level of the wine. The more viscous the wine and the more noticeable the legs, the higher the alcohol content is likely to be.